Scientific Background: The octapeptide circulatory hormone Angiotensin II is a critical regulator of cardiovascular homeostasis formed in blood, with dual function in tissues of the brain, kidney, heart, and vasculature as an autocrine/paracrine growth hormone. The actions of angiotensin II are mediated by type one (AT1) and type two (AT2) angiotensin II receptors, members of the seven-transmembrane Gprotein coupled receptor (GPCR) family. AT1 receptors couple predominantly with Gq/11 alpha subunits, and signal through phospholipases C, D, and A2, inositol phosphates, and calcium channels, as well as a variety of serine/threonine and tyrosine kinases. AT1 expression is greatest in vascular smooth muscle, liver, kidney, adrenal cortex, brain, and lung, and is primarily responsible for the physiological effects of angiotensin II, including regulation of arterial blood pressure, electrolyte and water balance, thirst, hormone secretion, and renal function. The AT2 receptor displays approximately 30% identity to the AT1 receptor, and is highly expressed during embryonic development. AT2 expression in adult tissue is limited to the adrenal medulla, brain, and reproductive tissues, but is upregulated in injured tissue following myocardial infarction, vascular injury, and wound healing. AT2 receptor signaling is not dependent on G-protein coupling or receptor phosphorylation, although coupling to Gia2 and Gia3 alpha subunits occurs in some tissues. AT2 activation can stimulate tyrosine and serine/threonine phosphatases through activation of nitric oxide and cGMP, and appears to counteract the stimulatory effects of AT1 receptor and growth factor receptor signaling. Immunohistochemistry analysis of Wistar rat heart tissue stained with Angiotensin II Receptor (AT1) pAb, DY-682 (red) and Angiotensin II Receptor (AT2) pAb, DY-800 (green) at 0.25µg/ml. Odyssey detection – 700 nm AT1 (left), 800 nm AT2 (center), and simultaneous (right). AT1 and AT2 antibodies are available either as DY-682 or DY-800 conjugates. 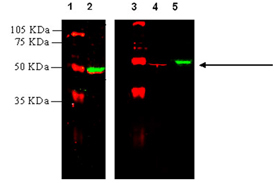 Western blot analysis: MW marker (1,3); 20μg rat brain extract (2); 20μg AT1-expressing CHO cell lysate (4); 20μg AT2-expressing CHO cell lysate (5) probed simultaneously with Angiotensin II Receptor (AT1) pAb, DY-682 (red) and Angiotensin II Receptor (AT2) pAb, DY-800 (green) at 0.22µg/ml. Odyssey detection – 700 nm AT1, 800 nm AT2. AT1 and AT2 antibodies are available either as DY-682 or DY-800 conjugates.